The 1991 Gulf War will forever be associated with Iraqi Scud missiles and the efforts of one special forces unit to hunt them down and destroy them: the British Special Air Service (SAS). In fact, the SAS's role in the conflict was much broader than Scud hunting, but for some years the Regiment's campaign during the conflict was shrouded in secrecy and misinformation, and little that was printed adequately explained just what the SAS did during the United Nations war against Saddam Hussein. SAS in the Gulf War is the full, dramatic story of the SAS in the Gulf war, and reveals how Britain's super elite played an integral part in the eventual Allied victory. Drawing upon unpublished accounts from SAS soldiers who fought in the war, as well as information that was previously classified, SAS in the Gulf War paints a vivid picture of what it's like to fight as an elite soldier, and what SAS operations were actually like behind Iraqi lines. Read about the special relationship that grew up between SAS soldiers and the Royal Air Force helicopter crews who flew teams deep into enemy-held territory; the heart-rending tale of the patrol codenamed `Bravo Two Zero' and its desperate attempts to flee hordes of heavily armed pursuers; the breathtaking accounts of combat between SAS mobile fighting columns and Iraqi Scud launcher teams and armoured units; and the successful SAS role in the collation of intelligence from the Kuwaiti resistance. But the book is much more than a collection of first-hand accounts. It is also the definitive guide to every aspect of SAS operations in the Gulf War. Thus, it discusses where the SAS fitted in strategically with regard to the rescue of Western hostages and border reconnaissance; the cooperation between the SAS and US elite units that were in theatre in the Gulf; and much more. 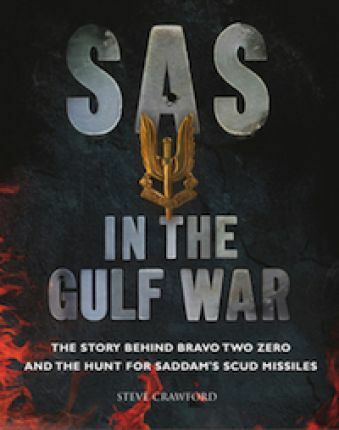 The book also takes a look at the weapons and equipment used by the SAS in the Gulf, such as the then revolutionary Global Positioning System, SAS Land Rovers, SAS small arms and customised support weapons. SAS in the Gulf War is a must for anyone interested in what the SAS really did during the First Gulf War. Steve Crawford has a postgraduate degree in military history from the University of York. A former employee of the British intelligence services, he has worked on numerous foreign assignments. He is author of The SAS Encyclopedia, The SAS at Close Quarters, SAS Gulf Warriors: The Truth Behind Bravo Two Zero, and Deadly Fighting Skills of the World.